Bio C Complex provides vitamin C along with bioflavonoids, which are widely distributed in plants particularly in vitamin C rich food and greatly increase the absorption of vitamin C by the body. Vitamin C is an antioxidant nutrient that contributes to the protection of cells from oxidative stress and to the normal functioning of the immune system. As a water soluble nutrient vitamin C supplies in the body are used up quicker under stress leading to a lowering of immune function and increased incidence of infections. Low levels are also associated with an increased risk of stroke and cardiovascular disease. Vitamin C helps towards collagen formation for many body tissues including skin, gums, teeth and cartilage found in joints. It enhances the absorption of iron in the body and is involved in energy metabolism and contributes to the reduction of tiredness and fatigue. 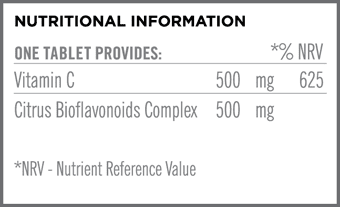 Bioflavonoids help support circulation and strengthen capillary integrity, they are also said to have a mild anti-histamine effect. Take one to three tablets daily with a meal. Vitamin C (with hydroxypropylmethylcellulose), Citrus Bioflavonoids Complex (citrus powder, calcium sulphate, cellulose, stearic acid, magnesium stearate, guar gum), di-Calcium Phosphate, Bulking agent: Microcrystalline Cellulose, Magnesium Stearate, Anti-caking agent: Silicon Dioxide, Glazing Agent: Hydroxypropylmethylcellulose.